Today I was in to clean my winter tires off I had just changed. The sign before you come in says 6 mins minimum so I thought ok I would time the 6 mins today. Soon as my timer goes off Im done and go to pay and the cashier says 10 mins. I said no its 6 mins and showed her timer on iPhone . I invite other customers to time their car washes. She said the time starts from when you grab ticket and I drove straight first Bay when I entered took 40 seconds to do that. Where does the 4 extra mins come from .. I asked her for owners business card and she said I ran out... shady.. I wont be using this business again and will be sharing this experience with people I know. 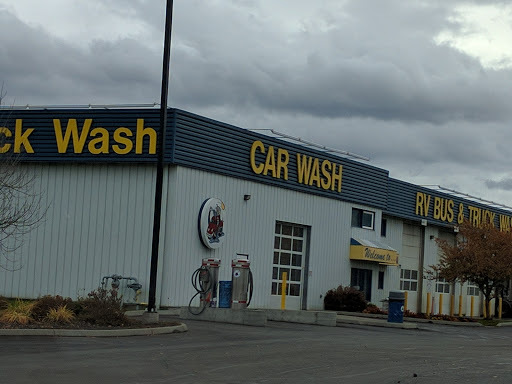 Best car wash in Kamloops hands down IMO. The pressure washers are always in perfect working order with lots of pressure and I have never had any trouble getting the various cleaning agents to work unlike other washes in town. The building is always kept clean. The only downside if you want to call it one is it can get absurdly busy and you may have to wait a while to get in sometimes. If there is a problem with the equipment staff are very quick to apologise and in my cases wipe out my bill. I had been going here for years before I had relocated. I still go to kamloops to visit family and when I do this is one of my favorite stops. Amazing idea and have never seen anything else like it! They are super knowledgeable of there products as I was asisted in a maguires product I didnt know existed. I recommend this to anyone who cares about there car and likes to take the time to do it right! Great place to wash your car ir truck at only $0.56c/m its a bit on the high side but i think if it was a bit cheaper i would be in there 3 times a week instead of once a month. Amazing staff and over all good experience. Absolutely love this car wash. Awesome products, equipment is always in good shape, reasonable rates, the bays are clean but most of all always the most friendly staff Ive come across, always smiling and around to help. Been here a million times and love it. Always clean for a car wash and they have a couple staff members that are awesome. Both have been there a long time I do believe. Awesome place. Almost everyone is great and very helpful. Their staff actually greets you and explains how everything works. The management should be proud. Great facility for all your car care needs. Clean bays and friendly staff family owned. Offers truck bays as well and a great selection of products. Clean wand car wash that doesnt skimp on soap out of their nozzles. Friendly staff and good selection of cleaning products. Excellent service. The staff were kind and helpful. Very low cost for a total self detail of your vehicle. Great place. Friendly staff and good rates. The company I work for gets all ours trucks washed here. The best place to wash my truck and trl. Really nice people, always very clean. Awesome wash and the truck /rv side is even better with built-in sani dump. Fantastic facility Mark and Michelle treat there customers like family. Great service. Friendly. Equipment and product worked great! Great place to clean your car and rates are very reasonable. They ad a surcharge on your bill if you pay with debt card. Bays are nice and clean..price is about average. Best car wash in Kamloops. 59 cents a minute. Convenient car washing with a decent price. Friendly staff and good bang for your buck. A bit of a wait, but a very nice car wash.